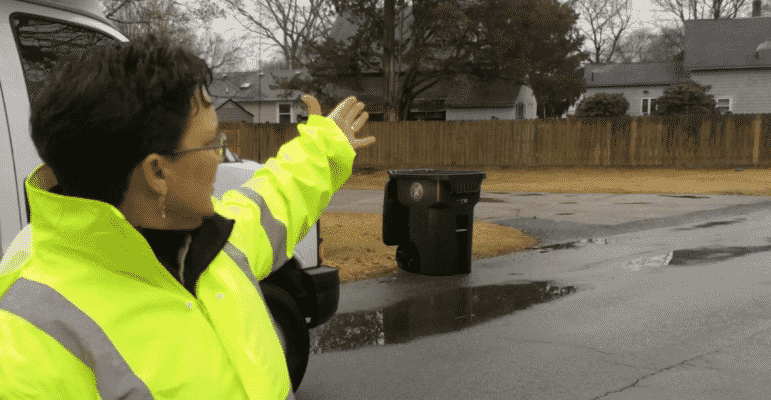 [CREDIT: Rob Borkowski] Janine Burke-Wells, executive director of the WSA, points out the smoke from a nearby house’s vents, the only spot smoke pumped into the sewer system is supposed to come from. [CREDIT: Rob Borkowski] John Hannon, WSA Collection Systems Manager, with a charcoal filter for manhole covers used to mitigate odors from sewer lines. WARWICK, RI — Within a few hours of the Warwick Sewer Authority’s smoke test of sewer lines along Cedar Swamp Road Wednesday, Executive Director Janine Burke-Wells had a few answers about the cause of complaints of hydrogen sulfide – related rotten egg odors. A few homes had their downspouts connected to the sewers, which isn’t supposed to happen, and there were a few cracked private property sewer lines that need repair, Burke-Wells said. WSA officials also knew that a number of manhole covers had pick-holes, used by WSA employees to hook bars into the covers for removal, that needed to be plugged. The testing, conducted by WSA consultant, Tighe & Bond, Inc., with the help of EST Associates, involved lowering a smoke bomb into manhole covers, covering them with an air pump, and pushing the smoke through the sewer lines along the street. Officials were alert for smoke coming out of places it shouldn’t, like faulty lines and downspouts, Burke-Wells said. In addition to correcting the improper sewer connections, which work both ways, and alerting homeowners to the need to fix the cracks in their private sewer lines, a number of charcoal filters will be applied to the manhole covers responsible for the worst of the complaints, Burke-Wells said. The filters, which fit neatly into the manholes below the covers, will neutralize hydrogen sulfide for about at year. Each one costs $500. At the end of the road facing the airport, behind a fence, lies the Cedar Swamp Pump Station, a squat brick building extending two stories below ground designed to handle about 7 million gallons of sewage a day. Burke-Wells said the facility handles about 2 million gallons per day, half of the city’s sewage flow. The station, also the site of the 2011 sewer line break, has been the source of a number of odor complaints in the area, Burke-Wells said. The full report on the testing will be ready for a community meeting Feb. 15 with City Councilman Timothy J. Howe at the Buttonwoods Community Center on Sandy Lane to discuss their findings. Howe and local resident Lewis Pickering requested City action on the complaints of odors in the area, Wells-Burke said. In Pickering’s case, the local man asked Mayor Scott Avedisian to get to the bottom of the problem while the Mayor was campaigning on the street, Burke-Wells said. Pickering also suggested the online odor report form at http://www.odor.warwicksewerauthority.com. She said the WSA is especially interested in the time of day the odor occurs. [CREDIT: Rob Borkowski] WSA subcontractors lower a smoke bomb into a manhole on Haven Street. [CREDIT: Rob Borkowski] WSA subcontractors place a n air pump over a manhole on Haven Street to pump smoke through the local sewer system.